Who didn't love MAD Magazine? We adored the fold-ins on the back cover, the little drawings in the margins (why was there always a fish skeleton in the pools of barf?) the advertising jabs (kids learned about ulcers, and Madison Avenue, and three-martini lunches) and most of all, the TV and movie parodies. Did they really dub "Facts of Life" the "Fats of Life," or was that Joan Rivers? (According to this list, they didn't -- they called it "The Yaks of Life," and "Dallas" was "Dullus," and "Happy Days" was "Crappy Days," and well, you get the picture. I personally never liked "Spy vs. Spy." It made me impatient. I was bothered by the lack of dialogue and even though I read somewhere that kids always picked one spy and always rooted for him or her, I never did. They were the same to me. 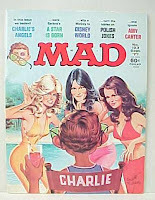 But I loved MAD, even though I think I owned more of those paperback book collections than I did actual magazine issues. It always felt so adult and racy and I think I was afraid to buy or ask for the magazine itself. Starting Sept. 6, MAD has its own show on Cartoon Network. This isn't the first time the show has been on the air, though. Here's part one of a MAD TV special that aired in 1974. My ultra-talented artist brother was always a big fan of MAD. He recently made a bust of Alfred E. Newman and sent a pic of himself with it to the magazine. The ran the pic with a cute, funny letter to him in the magazine. We bought every copy we could find. Too cool! !